This attractive, modern holiday complex is situated in a peaceful location above the beautiful beach of Esquinzo de Jandia. If you'd really like an away-from-it-all holiday, this is an ideal place to spend it. When we arrived, booking in was dealt with really well and there appeared to be additional staff on to cope. The complex is quite compact but because of the gardens and the winding paths, it feels more spacious. The pool area is large and there are a lot of sunbeds. Because we were travelling at low season, we didn't have any issues getting a sunbed, there were always plenty free. Food is standard for all inclusive - a cold buffet; hot section and fresh cooked, and the must have slow toaster in the morning! It does get a bit repetitive, but with some imagination you could always mix and match to make something different. The entertainment was poor. We only went a couple of times, and as soon as you saw the sorry looking stage and the badly hung curtains you knew you weren't going to get much. But they tried, and kids would love it whatever the quality. We didn't like the location as we like to walk our dinner off in the evening and there was nowhere to walk to, no shops to browse around or street restaurants to sit and watch the world go by, but that's our own fault for not researching properly, and shouldn't put anyone off the hotel itself. It's because of this that we wouldn't return to this hotel in particular. Jandia Princess is a lovely relaxing hotel complex, it is in a quiet area with no shops but that suited us. Jandia town is quite close by about 5 kilometres away, and only 1 euro on the bus to get there. Rooms were cleaned every day, staff brilliant and very friendly. No problems with the food at all, just avoided the more busy times. Lots of pools, loungers and plenty of drinks available. All in all a lovely hotel and will be going back. Quiet a large complex perched on a hill-top overlooking the beach . The accomodation is split into several 3 story tall blocks reached via winding paths thru some nice lush gardens with bordered with shrubs and palms. The room was a decent size twin which was kept daily spotlessly clean by the maids . We went in Sept and and the mozzies were a nuisance at night. Buy a good plugin repellant and keep it switched on. Obviously the food is buffet and the one large restuarant gets quiet busy and has a bit of a canteen decor and atmosphere -it seats several hundred. Guests were swerving around each other with plates and drinks while walking back and forth to their tables . Its not the place for a relaxing meal -more like 'eat and go'. As far as the A.I drinks go - great no problem decent beer wine and spirits and a couple of nice relaxing hotel bars for the evening time. The entertainment is pretty much the same as everywhere, but hey if you want world class entertainment go to Vegas. How anyone can design a hotel on a slope leading down to the beach and manage to leave the majority of rooms with no sea view is beyond me,but they managed it with this one. The reception/lobby area is certainly impressive although the lack of air-conditioning and greenhouse-like glass roof make the temperatures unbearable at this time of year.We went on the internet(1 Euro for 10 minutes)one evening but had to stop after 10 minutes as we were wet through with sweat. (sorry for that). This hotel is all show and no substance,as soon as you leave reception the facilities drop from 4 star to 3.The pool area at first sight is impressive but on closer inspection is in need of a thorough clean.I'm not a pool person,but I wouldn't have fancied a dip anyway.The entertainment room is much too small for the size of the hotel,and also lacking air-con,so is much too hot,and there were lots of unsupervised children of all ages roaming around the bar area until late at night.Sun-beds are packed around the pool,so if you fancy a dip you'll have to squeeze past as best you can.If you want a sunbed we found this to be the worst for them being reserved early morning,by 8.30 there were very few left unclaimed,and because there are no parasols at all,any in the shade were taken very early(usually by someone with one in the sun as well). Staff,with a few exceptions,were a miserable lot who just did a job without any attempt to interact with guests.The food was not what you would expect from a 4 star hotel,overcooked meat and fish from poor cuts(several times I had to dispose of my first choice meat as it was inedible and choose something else).There were mostly long queues for the hot dishes and the buffet generally was a bit of a free-for-all.For the first 4 days there were loads of flies on the salads,cheese and sweets which made them very unappealing.This was much improved after 4 days,presumably after someone complained.I think that this is the hotel ethos "wait until someone complains".We had to have a split and worn out mattress changed,as did many others during our stay,and the hotel seemed to have a supply of brand new mattresses ready and waiting.The receptionist never batted an eyelid when I asked for a repalacement. 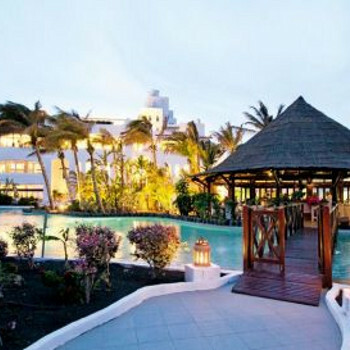 We booked this hotel to celebrate our 40th wedding anniversary,obviously we will not book it again if we make it to 50. Club Jandia Princess AI offers very good value. The food at dinner is not top notch but breakfast & lunch are fine- if you can find a table ! A very busy place, I think the hotel was sold out, not surprising at those rates. The atrium lounge area is attractive, the grounds well-kept and the variety of pools and bars is extraordinary. Pincess even allocate a space for nudists- carefully screened from the rest.The free drinks selection is very reasonable although all international brands are excluded. Believe the Entertainment is not so good but we don't go for that so can't really give an opinion. We went on an all inclusive holiday for 1 week to the jandia princess, what a fabulous place. Pool fantastic although a little cold. Views outstanding, food was lovely with plenty of choice. Rooms were large and kept spotless. Our favourite spot was the breakfast area overlooking the sea with splended views. Weather was fantastic ranging from 22deg to 29 deg.We didn't go anywhere as we enjoyed this hotel so much. Staff were very polite and friendly. We have just returned from our 3rd winter break at this hotel. Once again the whole holiday has been great. I posted a review of this hotel 2 years ago (on another review site) and was amazed when I read some of the reviews on this and other sites regarding the refurbishment of the pool areas. I found that it was done in such a way that it caused little or no problem. There is so much space around the pool area that you can be away from any work area as these were closed off areas anyway. This hotel is open all year round so how people expect this routine maintenance to be carried out is beyond me. The food is varied and very good it offers a wide range and caters for all tastes. People have also commented on how the Germans seem to dominate the place, they are the majority but are not any different than anyone else on holiday there. There is an area at the bottom end of the pool areas that is sectioned off and is designated as a naturist area. There is also a sauna and steam room for guests in this area.No one bothers if you go in there keep you shorts or bathing costume on, but some protocol is expected. (sit or lie on a towel with feet on it as well, to absorb sweat) I feel this should be stated at the welcome meeting to save any embarrassment. The walk to Jandia is fantastic along the beach. You can feed the chipmunks along the way. Jandia is a resort that caters mainly for Germans but a bar with a beer is a bar with a beer. The entertainment in the hotel this year was better than last with a Drifters tribute, Tropicana dancers and a comedy Acrobat troop that were good, we gave the Animation teams efforts a miss and enjoyed a beer in the Coco Loca Bar (thanks Eric). This hotel is great for anyone looking to chill out and relax for a week. I would not think it would suit teenagers looking for some lively entertainment, but for a winter break it fits the bill to a tee. Stayed here for a week at the beginning of December and will definitely return. After staying at the other two large resorts on the island Jandia definately had the edge. The hotel is about 8km outside the town in a fantastic position above the beach. There are no bars shops or restaurant in the vicinity however you dont need them as you stay all inclusive. Could not fault the rooms or the facilities - food and drink is plentiful and adequate. More than enough choice at mealtimes however we found we were not hungry at the end of the week as we had never taken this option before and would normally not eat three cooked meals a day but could imagine after two weeks it would be repetitive. Several bars to choose from and there was entertainment though we never stayed around preferring wine on the balcony. The beach was wonderful and you could just walk and walk (watch out for the naturists though) - a pleasant walk into Jandia and you could feed the chipmunks on the way. Jandia was a pleasant enough town but we were glad we were not staying here. Lots of gift shops and perfume shops. A taxi into the town was not much dearer than the bus and was quicker - we also took advantage of the supermarkets for some wine etc for the room as it was much cheaper than the shop at the hotel - no they dont like you taking too much at the bar! If you want a peaceful relaxing holiday and do not mind being with other Europeans this is a great place to go.